Recently, there was a lot of discussion on a potential change to the price-matching policy at Real Canadian Superstore with some people being told by cashiers that they would be limiting price-matching to one item per person. Nancy sent us this image from a handout at her local store with details on the changes with a similar image posted on our forums by web3 so it seems to be a province-wide change. 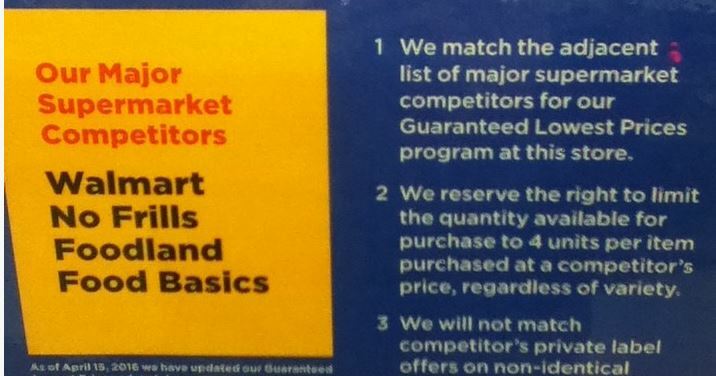 Similar to the changes at No Frills last year, stores will now advertise a list of competitors that they are willing to price-match. 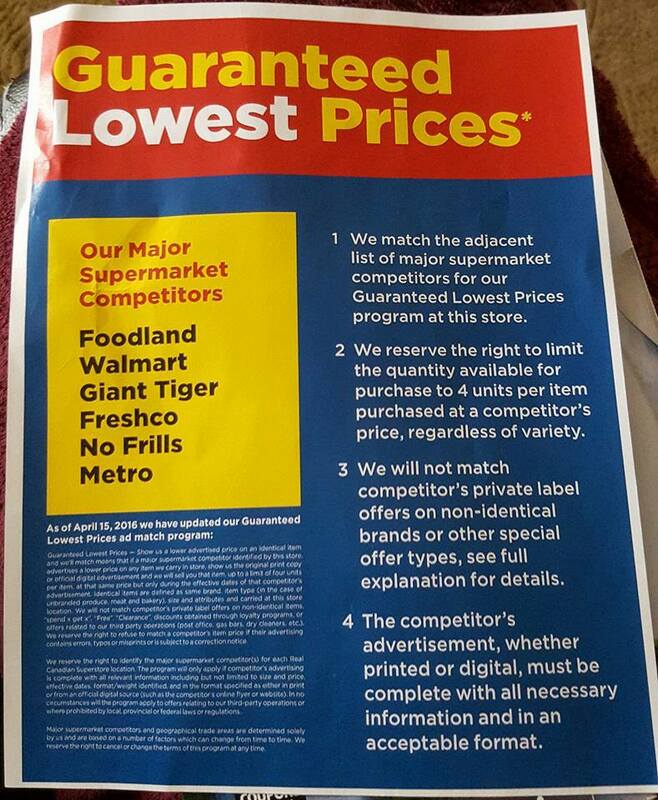 For those who shop at No Frills and experienced issues with them not price-matching “sister stores” like RCSS and Fortinos, this image shows that this store will price-match No Frills so it should not be an issue. They will allow a price-match of four items regardless of flavour/scent/variety for each ad-match. However, it says they reserve the right to limit to four, so some stores may be more relaxed on this rule. As far as couponing, they have not released a similar handout but from Nancy’s store, it also seems that the one coupon per customer was also misunderstood by cashiers. That particular store (GTA area) will accept up to 4 similar coupons, but will not allow more than one coupon to be used on grouped items. For example, if you bought three packs of Maple Leaf bacon with the $2.50 coupons, they would not allow you to use the coupon for the free ready Crisp or Stuffed Chicken as coupons were used on the bacon. Most cashiers will still need an override when you use more than $10 in coupons, it is a good idea to tell them ahead of time so they can call a supervisor over if necessary as many of the cashiers are confused over the new rules. For those worried about price-matching Food Basics, stores are chosen based on local competitors, and as you can see from web3’s image, Food Basics will be matched where local. Personally, when the rules become too restrictive or complicated, I simply shop elsewhere. The No Frills where I used to shop, often did not have flyer items available on the very day that the sale began. I switched to Food Basics whose policy is that they guarantee that they will have flyer items in stock, but if they are unable to provide a flyer item, it will be discounted by 10 per cent the next time you shop there. This store always has stock so I am not disappointed and now Food Basics have my business. Who needs the hassles of no stock or restrictive price matching polices? Not me. This is not a good move for the RCSS. It’s forcing their customer to have to shop elsewhere to get the lower price. Groceries are extremely expensive so if I can save a buck or two, you bet I will and I will not buy it from the superstore if I know I can’t get the cheaper at shoppers or giant tiger! No Food Basics? I find that hard to believe. Food Basics is a major competitor to the RCSS here in Ottawa West, anyway. I will just take my money to Food Basics now. There may not be a Food Basics store near that location? Back to Food Basics I go. Use to shop there until RCSS launched price matching. On a weekly basis — without fail — for over a year, Food Basics has beaten RCSS prices on several items. Maybe that is why RCSS has banned them. So there is no longer any need for me to shop at RCSS. I don’t think they banned them, I think there just is not a store near this user since they will decide geographically. Hi Ed, I’m an extreme shopper. I go around to find the best prices and deals in my area. I could tell you that you are wrong regarding your opinion of Superstore pricing vs. Food Basics but I won’t. Instead, I would challenge you to go to Basics with your shopping list one week, Superstore the next. Compare the final bill. Basics is not cheaper. They also limit how many flyer items you can purchase such as meat to 1. Try feeding a family with only one tray pack of meat. No one can beat RCSS for selection and quality & cleanliness. If this keeps certain shoppers away, then thank you RCSS! What are certain customers you don’t like; ones that want to save money. Saving money is a crime in your perspective ? Maybe yours is. My 2 local RCSS are no better for quality than the Fresco practically across the street, and their selection is on par with multiple grocers. The produce is no better than No Frills (so, not great) and significantly more expensive. It almost sounds like you work for them. Nope, never worked for them, have nothing to gain by promoting them, but thank you for your narrow minded judgment. Have been a customer for 25 years, and am not about to give it up because I truly love the store and RCSS’s competitors in Ontario are pretty disgusting. One tip for everyone, Price Matching is heading towards extinction in Canada; this is a clear sign that stores don’t want to do it anymore, too many restrictions. How many years left before all stores, including Wal-Mart stop it, sooner then later. It’s a real bummer, I do have sympathy, I liked price matching but with no price matching stores better be prepared people won’t pay their high prices. Unless you like paying high prices and loosing money, that is your choice, your money. Think that you are right. First step is restricting the stores that they price match. Second step is limiting quantities (although I have no problem with a limit of four because people filling their carts a particular item is unfair to fellow shoppers). Finally, the price match policy disappears all together. A cashier confided to me that the franchisee at my local No Frills hates the policy and is lobbying for Loblaws (parent company of No Frills) to drop the price match policy. This is absurd. These big box companies just want a monopoly on the market, this way they can control pricing on all products. I personally love price matching from the smaller stores (ie- the independent chinese stores etc). We are consumers and deserve the best possible prices especially since these companies are still making a big buck even if they do allow price matching. This news is nothing new for me. My RCSS in North Toronto has had these restrictions in place for a year now. There is a list of stores which they will PM but you can only purchase a max quantity of 4 units/item. One issue for me is the fact that they do not accept PMs on multiples in competitors flyers. For example, if broccoli is listed as 2/$4 at FreshCo, RCSS will not PM it as the price is not listed per item, but for 2. In this example even if you buy 2 broccolis they would still not accept the PM. Luckily some flyers will say “2/$4 or $2 each” which makes the PM possible. I never go to RCSS anymore as I find my local NoFrills is better for PMing at the moment since they accept pretty much all major competitors and don’t give me a hard time about it. Letting you know you are still supporting RCSS since No Frills is own by the same company in the end. So shop at one is shopping at them all. Well, Superstore has been testing my patience for months now from issues with price matching, to coupon issues, to sale issue and the list goes on. If this comes true for the locations that I primarily shop at (St.Catharines while at university and Ajax while at home), then they may lose my business, I normally price match everything that I buy at their stores, and if it becomes more of a struggle than it already is, then I’m really done with them! Somebody I know asked Walmart not to long ago if they priced match an item she wanted to buy and the cashier said you can buy as many as you want. Walmart varies a lot by store Monique. I have 3 within easy shopping distance, one will only PM major stores (as in they won’t PM the smaller stores in the city even if nearby) that are local with “reasonable limits” – as in you can’t buy a case but they are fairly lax on the numbers, another will PM Ontario wide and depends on the supervisor, sometimes 4 sometimes as much as 8. The other one seems to let you PM anything you want. I forgot to mention they do not accept price match from Giant Tiger even we have one in Town but they accept price match if I am correct from Foodland. I didn’t know there was a Foodland nearby. No Frills had a limit of 4 coupon if you wanted to buy 4 of that item but not more then 4. I don’t mind the 4 per customer I think that’s fine, what I don’t like is limiting the stores. I price match Shoppers sometimes, hair dye, tooth paste, deodorant etc. Also, if they eventually stop accepting coupons I will be one skinny girl, I will not pay regular price for a lot of the expensive products!! My RCSS already has a limit of 6, so no biggie. No store HAS to price match, they do it to gain customers. In my area Metro and Food Basics do not price match, yet RCSS was willing to match those stores. People need to find bigger issues to whine about. nisiepie – This is a issue to Whine about, don’t tell people that they are the problem because you are an isolated customer who pays any price. I price match the heck out of everything that I can. I coupon like crazy. Been doing it for 10 years. I also appreciate limits that leave enough for everyone. If they don’t want to price match 2 out of the 10 stores in my area, I do not think that is unreasonable. It is more than fair because they are price matching stores that do not price match at all. I am allowed an opinion on this. Just because I think it is fair, and am not siding with the majority who think a limit is outrageous, does not mean it is ok to single me out for my own opinions and comments. I didn’t make comments that were singling out other commenters. I’m afraid to inform most of you, limiting your quantity of food is what was started in Venezuela, it’s communism. There is an abundance for everyone, whether you want 4,8 or 22 it is your right in a Country like Canada or the US, but I’ll keep the focus on Canada, you are the consumer. Whether you agree or not, doesn’t matter it’s happening slowly but surely. Everyone just keep letting it happen. Limits on price matching will likely not lead to communism. In London Ontario, No Frills has dropped price matching for a couple of months now. I think it is a “pilot project”/test. I do shop less there now because of this. Christopher, RCSS is not placing a limit on the quantity of items one can buy (except for a rare limit in their own flyer). They are limiting the quantity of items one can buy *when matching the competitor price*. If you think this leads to communism, then you’re welcome to move to another country which has a more free market. Like most of the other commenters, I happen to agree that it’s a reasonable restriction to improve the likelihood of there being enough stock for everyone who wants to buy that item, and I also think that limiting the list of price match eligible competitors to a selected few which excludes several other competitors within the local area who have flyers and ads, is UNreasonable. The limit per item is a great idea. Have you seen the carts go through. And then the shelves empty. To find it on your local corner store for 3-5 dollars more. Those stores have vendors they are suppose to go through but don’t cause they are scamming the system. They are the ones you need to be pissed at. When one person comes through with over 60 bottles of pop. There needs to be a limit. And 4 is a reasonable limit. Make 2 trips if you need 8 then. Someguy – No country has a free market anymore. If you read up as much as I have what has gone on alone in, as I mentioned Venezuela you would come to realize it is communism. I’m going to quote something Obama said to people, and quite possible the world. “There is no difference between Capitalism and Communism”. If there is no difference then both can be brought societies. Most convenience store owners take large amounts of these main things, bottle water, soda (pop). Everything else is not in large amounts, they may buy twenty jars of peanut butter or less but not more as they don’t have the shelf space and don’t sell alot of it, why buy forty jars of Peanut butter ! One more thing, I understand they are putting a limit on competitors limit regarding price matching; the reason being, the store for which you are price matching at doesn’t care if you buy thirty-five items at the current store price. The store for which you are price matching doesn’t want you to get the same item for less, it’s called greed. The end result is the customer gets hurt, if they are limited they have to pay the high price and many people are on budgets and fixed incomes. That’s why I say they should abolish Price Matching, then wait five years and you’ll see the result. What kills me is these poverty groups complaining that people can’t afford food. No one looks to the culprit, grocery chains. Do you think a 100g Chocolate bar, which I know isn’t healthy, justifiably worth $3.89 ? Or four danishes from a Grocery Bakery $4.99 ? People want to eat, although some people out there do live to eat. I don’t know why customers of RCSS have to do the price matching at all… many years ago they used to be proactive and actually price their merchandise a cent or more below competitors. In fact, RCSS went out of their way to inform customers of their proactive pricing policy with respect to the competition. At one time in my area, they used to post numerous pages from competitors flyers at the store entrances using marker pens to cross out printed prices and hand write RCSS lower prices over top. Sadly, they can no longer be bothered. Paul – You just don’t get it. Don’t feel isolated, your one of many. Sadly it comes down to one simple issue with the old comparison carts they had at the front of stores showing what it cost at Store A and how much more it was at Store B; being proactive and making sure you offer the best price means your competition can do the same and then eventually someone has to give in. To my knowledge I would expect Walmart to have better buying power than Loblaws (I could be wrong) so they could afford to undercut the Loblaws stores and not have it be too much of an impact on their bottom line. I was not aware that Walmart had changed their price matching policy and was shocked when they would price match on a multi-buy or partial multi-buy. I only wanted 1 loaf of bread and Metro was charging 2/$5 or $2.99 each and the Walmart cashier gave it to me for $2.50. I know my local Frescho has changed their policy and they’ll now price match most grocery stores (before they would not price match No Frills as there isn’t one in Bowmanville for example), but they still exclude Giant Tiger and the pharmacies. I find Walmart to be the least bothersome when trying to price match and a lot of the time the cashiers tend to know what price you’re going to be matching so you save some time that way – or they’ll know of a better price in some instances! No two RCSS have the same list of stores that they will price match. Walmart, FreshCo, and Giant Tiger still price match any store. Depends where you are, one of my local Giant Tiger stores considers local to be such a small area that they PM only a handful of stores. FreshCo here has a limit of 2 items per price-match too so isn’t always the best choice. I hate the new rules , now I have to shop at 3 stores instead of 1 ! Maybe I will find out the other stores have better everyday prices ! Is anyone tracking which individual stores have the best lists? RCS @ Dufferin/Steele’s has a great list. Anyone know a place where people are tracking this? I live in Aurora. Would love to know for local shopping. The Dufferin Mall Walmart has stopped price matching “chinese flyers” by which I think they mean all small store flyers. I was shocked to find out that includes giant tiger. They said they had changed their policies for a while which was interesting since I had been to another Walmart just a few days ago and did not have any restrictions put on price matching. Have had many issues with the Dufferin Walmart. They would not price match pesto with the other pasta sauces because it was a smaller bottle (even though flyer mentioned that size) and did not have the words pasta sauce on it, LOL. Well I just tell them i don’t need it and laugh at the cashier’s ignorance. This is why everyone should just shop at Walmart. RCSS is just too expensive. Walmart has almost no restrictions on price matches, except that they don’t price match from bargain and wholesale stores, which is fair. I really only go to other stores to buy things that aren’t sold in Walmart (like PC brand items) or just when I’m in the area lol that’s it! The reason they pull stunts like this is to see what people will put up with. Mark my words. Canadians will grumble about it, then pay anyway. Canadians have to be the biggest bunch of paper tigers in the world. They always capitulate and I guarantee this time will be no different. We wouldn’t want to cause a fuss, after all.